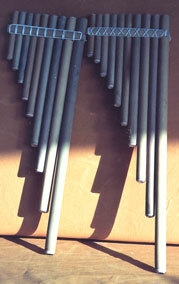 It exists many types of flutes from the Andes, the most known and played are the Sikus and Quenas. In the indian language, the word Siku means aymara and quechua. This instrument is also famous under the spanish word: zampoña and in french under the call of flute de pan (panpipes). This term may be mistaken with the panpipes from Romania, a very similar instrument but which has a different appearance and interpretation ( there is only one wooden bowed pipes row). The Siku is currently made in four different sizes: the chulis, the maltas, the zankas and the toyos) which are cut out of bot reed growing in the Bolivian Amazon, La Paz's area (Zongo). This a kind of very thin Bamboo, known by the name of challa. The Siku is a diatonic instrument, which possesses two raws: the Arca and the Ira. The way it is traditionnally played is with two flutists each having one raw and both responding to each other. The instrument may be played by one personn, though. The personn will just have to blow the two raws alone. The Siku is usually tuned in G major, E minor, but it can be tuned in other tonalities. When a third raw is added, the Siku becomes chromatic.This means it has natural notes, and sharps as well. This third raw is placed above the two others. Le The Chromatic Siku with two raws only is made since a short time ago. The chromatic Siku is made of two raws: the natural notes and the sharps are distributed along the two raws, in an intercalated way like the piano. As a result the chromatic Siku can be played in any tonality. The low notes are located on the right side and the high notes are situated on the left side. The chromatic Siku is to be played from the right to the left, even for the the diatonic Siku. The Quena or Indian flute, is the most famous of this kind.It is made in a large reed growing in the Bolivian Amazon. This instrument is also tuned in major G and minor Ebut it can be made and tuned in some others tonalities. 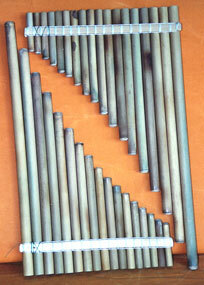 Three octaves can come out of this instrument, however the higher octave needs a particular technique to be sorted out. Nowadays, the Quena may be made from a great variety of woods such as bamboo or ebony. In my opinion, the Quena's original and natural sonority is in this case not the same any more. However, it is up to the flutist to choose his material.